will be available. Drugs will also be distrubuted free of cost. One out of every five MLAs in five states where elections were held recently has a criminal background. In NCT this figure is close to 40%. Of a total of 549 MLAs elected to assemblies in Madhya Pradesh, Rajasthan, Chhattisgarh, Delhi and Mizoram, 124 have criminal records with the Congress topping the list with 59 while the BJP has 49, according to a report prepared by ‘National Election Watch’. Madhya Pradesh has a maximum of 54 such legislators while Rajasthan is second with 30 MLAs with criminal backgrounds. Delhi has 27 tainted MLAs followed by Chhattisgarh with 11 and Mizoram has 3. Of the 3,179 candidates in Madhya Pradesh, 91 had criminal background, the study said, adding 27 legislators from the BJP, 23 from Congress and four others with criminal background won the elections. This constituted 23 per cent of the total 230 MLAs who were elected to the BJP-ruled state, the report claimed. In Rajasthan, 2,194 candidates contested the polls, and 189 had criminal records. Thirteen from the Congress, seven from the BJP, and 10 others, including three from the BSP, won the polls, it said, adding 15 per cent of the 200 Rajasthan MLAs had a criminal background. National capital Delhi, where 91 candidates had a criminal background, 16 from the Congress and nine from the BJP won in the electoral battle besides one each from the BSP and INLD. The figure comes to a whopping 39 per cent of a total of 70 seats. In Chhattisgarh, which went to polls for 90 seats, a total of 1,066 candidates contested of whom nearly 76 had criminal records. The BJP and Congress MLAS with criminal records stood at six and five respectively, constituting nearly 12 per cent of the total seats. The situation is no better in the Parliament. Nearly a quarter (23.2%) of the MPs has reported criminal cases against them. One out of two among them (over 50%) have cases that could attract penalties of imprisonment of five or more years. The states of Bihar, U.P., Jharkhand and Madhya Pradesh that account for over 50% of the MPs with the high penalty criminal cases. The Representation of the People (Second Amendment) Bill, 2008 introduced in Rajya Sabha on the 24th October, 2008 and pending therein, has been referred to the Department Related Parliamentary Standing Committee on Personnel, Public Grievances, Law and Justice, headed by Dr. E.M. Sudarsana Natchiappan, Member, Rajya Sabha for examination and report. 2. The Bill, introduced in pursuance of the examination of the proposals of the Election Commission of India on electoral reforms by the Government, proposes to amend the Representation of the People Act, 1950 and the Representation of the People Act, 1951. (iv) insertion of new sections 126A and 126B for restricting the publication of results of all exit polls by whatever means till the last poll in an election is held. 4. The Committee has decided to invite memoranda containing views of the individuals/organizations interested in the subject-matter of the Bill and also to hear oral evidence on the subject. 5. Those desirous of submitting memoranda on the Bill to the Committee may send two typewritten copies thereof in double-space (either in English or Hindi) to Shri K.P. Singh, Joint Director, Rajya Sabha Secretariat, Room No. 212A, Parliament House Annexe, New Delhi‑110001 (Tel: 23034292 and Fax 23016784, E-mail: kpsingh@sansad.nic.in and rs-cpers@sansad.nic.in) up to 17th December 2008, indicating whether they would also be interested in giving oral evidence before the Committee. 6. The memoranda, which might be submitted to the Committee, would form part of the records of the Committee and would be treated as confidential and would not be circulated to anyone and any act contrary thereto would constitute a breach of privilege of the Committee. Its a great day for all the people who have cared and worked for the sharpness of Right to information act. Amid fears from the Supreme Court and the Parliament to throttle the act. today we all have a reason to celebrate. One our friends, former IITian and renowed RTI activist from Mumbai, Mr Shailesh Gandhi has been appointed as Central Information Commisoner and Central Information Commision. Sixty-one-year-old Shailesh Gandhi, who was awarded the Nani Palkhiwala Award for civil liberties this year, is widely known for using the RTI Act effectively for better governance and accountability in public life. It is heartening that has been appointed as theChief Information Commissioner. Gandhi’s appointment will also create a piquant situation for the three other commsioners as he claims he will function as an information commissioner for a token salary of Re 1, and not take the bungalow and other perks. In our experience, whenever a new person takes charge of a senior post in Government, by the time that person understands the systems and how things work, their term is almost over. Hence, unless there is clarity of purpose at the start, there is a chance either of that person soon thinking from the government's point of view, and accepting the limitations of government, or of that person getting frustrated and opting to leave and work from outside the government. We request you to suggest to Mr. Gandhi as targets and objectives for a year, and clear principles and non-negotiables that will help achieve these targets. Now we can expect a flury of people oriented decissions from CIC. as we have first ever RTI activist and Non-IAS commsioner in CIC. Youth for equality wishes him a inspiring tenure. Till date, our members have established two camps. One base camp is at Simraha.They have already attended more than 2000 patients. This camp is working round the clock and is open 24 hours a day. The other one is mobile team which is moving around the flood areas that to be near the Bhutia dam where around 2 feet water is still there thus they are moving on cycles and rickshaws.No Government medical camp , only food distribution is being done over there. Army is also present there and is doing the rescue operation. Our team has seen more than 500 patients in this area. Tomorrow another team is leaving from New Delhi to Patna. Screening of Umesh Agrawal’s my latest film DIVIDED COLORS OF A NATION, produced by PSBT & PRASAR BHARATI, will be carried out on 13th September 2008, at 6.15 P.M. Indian Habitat centre. Its a 60 minute film in English. It focuses on caste based reservation in India, an issue that concerns all of us in one way or the other. The film will be screened as part of Open Frame International Film festival, organized by PSBT & Prasar Bharati. The screening will be followed by an open forum. All the involved parties in this issue will participate in the forum. All of us have been invited for the screening ceremony. Umesh Agarwal on his documentary on reservation. You seldom find documentaries that walk the tight rope of veracity. And if the issue is caste reservation, it becomes all the more difficult not to fall on one side of the divide. Umesh Agarwal has managed to do the balancing act in his latest film Divided Colors Of A Nation. The film not only scans the concept of caste-based reservation since it made an entry into the Constitution courtesy the very first amendment and its usage as a political tool over the years, but also looks into the status of education in the country. “The film is not pro or against reservation, but it does say when there is disparity at the level of grassroots education, what is the use of reservation,” says Umesh. He has travelled from Delhi to Rajasthan to Andhra Pradesh to prove his point. At some places he didn’t find a teacher in government schools in villages, at others he found 200 students of five grades being taught together. He discovered that most of the teachers appointed to these schools are from cities and they don’t want to travel to villages every day. “Instead they have made arrangements where a local man marks attendance on the teacher’s behalf. Students don’t even know the name of their school and teacher.” But what takes the bakery is the government primary school in Gosainganj in Lucknow. Here the teacher at the dilapidated school fails to name the President of India. “Originally I had no plans to look into the educational aspect, but the Gujjar agitation made me think about the state of education. In Rajasthan the pass percentage of the State Board’s High School examination is not more than 50 percent in the last 10 years. Around the same time, the ‘Aaja Nachle’ controversy happened in Lucknow. I was in the city at that time. I was curious to know the state of education in the state where there is such high caste consciousness that the government led by a Dalit Chief Minister bans a film where a line in a song has casteist overtones. Most of the students in the Gosainganj school come from scheduled caste and Muslim families.” The film also points out how public schools made on subsidised land are not imparting free education to the deprived, which is their fundamental right. Umesh says this gross negligence of primary education has resulted in a situation where there are vacant seats in the reserved quota in prestigious institutes but there are no students despite all the relaxations. Then Umesh takes us to the other spectrum of the issue — whether the ‘creamy’ layer of the scheduled castes, tribes and other backward castes should get the benefit of reservation. “The Supreme Court has said that the creamy layer from other backward classes should not get the benefits of reservation but hardly any state government has taken note of it. They keep on amending the law to suit their political agenda. I feel the economically well off SCs and STs should also be included in the creamy layer so that their seat goes to the really deserving one.” Umesh has taken into the account diverse point of views without being judgemental. The film also points out how the number of castes has increased in the last six decades with the demand for reservation. “We are increasingly becoming casteist. In Rajasthan, there are separate crematoriums for Jaats, Meenas and Gujjars. I agree with what Naryan Moorthy said: India is the only country where people are thronging the streets to be called backward.”The film will be screened on September 13 at PSBT’s Open Frame festival at the India Habitat Centre and followed by a discussion. A retired Cabinet Secretary who belongs to a scheduled caste feels his grandsons also deserve the benefits of reservation. Sharat Babu, an SC student who went to IIM, Ahmedabad, and now runs his own food business, feels his kids don’t need reservation. When asked how one should explain the reservation policy to an 18-year-old, UGC Chairman Sukhadeo Thorat feels he should be told this is how the wrongs of the past could be corrected. There is a good news for all of us from Madhya Pradesh. 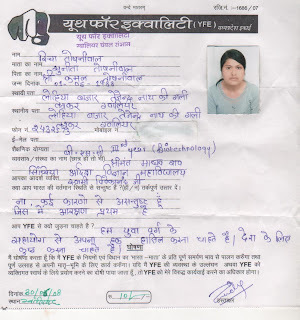 YFE, MP candidate "Richa Toshniwal" has been elected president of S.M.S. Government Model Science College, Gwalior. This is second largest science college in Madhya Pradesh. Many congratulations to all YFE members and thanks to our YFE members in MP who have worked hard to achieve this win in this student election. There are some more students election in line for us and and we should work hard to replicate this success there also. “Doctors For You” is launching a massive flood relief operation in Bihar with over 1500 specialist doctors & other volunteers, in association with Indian Railways & Youth For Equality. We will not only be treating the injured & diseased, but also be preparing to tackle the aftermath of the floods. Indian Railways is providing all Infra structure support to Doctors For You for this initiative. The destruction caused by Hurricane Katrina, Orissa cyclones & recent tsunami pale in comparison, when we look at the magnitude of destruction caused by this flood. And this has resulted in the biggest ever evacuation of people witnessed in the history of mankind. Towns after towns are being converted into ghost places. Hundreds of thousands of people are lacking food, medicine and drinking water--and the situation could get worse. In the 1st phase of operation, we will be targeting the six worst affected districts namely, Supaul, Saharsa, Madhepura, Araria, Purnia & Katihar. Our interim relief team is already in the process of setting up control rooms at Mansi & Katihar railway stations for this operation. In the 2nd phase, we will be undertaking rehabilitative work for 3 month after the floodwaters recede. We appeal to all to help the victims of this catastrophe by sending food, clothes, medicines, waterproof tents, cooking utensils & water purification plants. We call upon every human being with a conscience to show solidarity with the victims of this catastrophe by immediately extending all kinds of help in our relief, rescue & rehabilitation operations. Next week or next month may be too late. To address the prevailing national calamity in Bihar, shortly a team of Doctors and Volunteers will be heading towards the various flood affected districts of Bihar. “YOUTH FOR EQUALITY” in collaboration with the Mumbai based “DOCTORS FOR YOU” and “INDIAN RAILWAY” preparing the logistic to implement the rescue plan. Considering the prediction of future flow of water in Kosi River particularly from Nepal, the scenario will remain same for few days which needed to be addressed without delay. This requires stationing of volunteers in Bihar for some days. Doctors from various parts of India will be traveling to undertake rescue related work and accompanying volunteers will share the responsibility of management. We require volunteers/doctors at this hour of need to help a large section of humanity in Bihar. Please contact us for participation in this rescue work and to offer any kind of service. Youth For Equality is contesting in DUSU elections to be held on 5th September 2008. We are contesting for all the four posts of DUSU office bearers. All the four candidates have been chosen on the basis of our ideology. Through this election we will make more and more students aware of the divisive reservation policy. We will continue to spread the message of SAY NO TO CASTE BASED RESERVATION. We will try to reach all the students of university and convince them about our ideology. Student to student contact will be our strongest mode of campaigning. We appeal all the like minded students to extend their support and ensure victory of ANTI RESERVATION VOICE. If we get an opportunity as an representative of students, our focus would be on improvement of basic amenities for students in campus. SAVE YOUTH FOR BETTER NATION would be our agenda. · Institution of campus placement cells in all colleges. · Carrier counseling by renowned experts from different fields. · Betterment of academic facilities in all colleges. · Improvement of Transportation facility. · Hostel facility for outstation students. 'Keep your doors and windows open; let fresh air and ideas come from all sides’ said Mahatma Gandhi. It is especially vital for a university, the embodiment of knowledge and tolerance. Censorship must not be allowed for the students as the students are adult and know how to absorb contents. Imposing one’s idea is like sharing brotherhood with Hitler and likes. The visit of Mr. Richard Boucher, Asst. Secretary of State to JNU and the proposed left party’s opposition has been reducing the credential of JNU as a university of excellence. The protest bye the Left supported student organizations can be best explained as the handiwork of small time, illiterate and corrupt politicians, who do not believe in democratic norms and tolerance. Youth For Equality believes that the visit of person of eminence to JNU, irrespective of their academic/political/national affiliations (unless and until they are criminal or convicted), must be promoted inside the campus, for it is the duty of the university to promote knowledge, debate, discussion and civilizational interaction. Youth For Equality wonders how many students of this campus think an adverse tie with the United States especially in the backdrop of the fact that America is the biggest trade partner of India and India send the largest number of students to this country for higher study (including a large number of students from our own university) and as there are more than 2.2 Millions Indians are residing in the US. JNU had signed more than 73 Memorandum of Understandings with various foreign universities. Majority of them are with American. Are the left oriented student organizations going to demand the scrapping of such agreement? 1) They never opposed US Treasury Secretary Henry M. Paulson, Jr. during his 28 October 2007 visit to Kolkata. Paulson, Jr. issued the following statement following a meeting with West Bengal Chief Minister Bhattacharjee: "The United States admires India's progress over the last decade as a result of economic reforms from leaders such as the Honorable Chief Minister. We discussed ways to increase investment in West Bengal. The U.S. is very interested in increasing such investment. 2) They never oppose Henry Kissinger’s visit to Kolkata on 3 November 2007. Kissinger, who was on a visit to the city, met Chief Minister Buddhadeb Bhattacharjee and had a closed-door meeting with him, which lasted for about 50 minutes. After the meeting Kissinger said, “The US had never thought India would lean towards that country”. 3) Prakash Karat, who opposed the nuclear deal and America in public but preferred US for his latest summer vacation in 2008. YFE have no interest in promoting the US ideas in India or we hardly connect ourselves with the imperialistic policy of the US in Iraq or in other parts of the world. We oppose the Iraq occupation as even the US citizens are also opposing the Iraq occupation and the next US President Election will be tested on this issue as well. But we support Freedom of Expression, exchange of knowledge and understanding civilizations through dialogue and conversation. The name of JNU should not be defamed by obscurantist thought and mean political ideology/activity. We must end the culture of disruption inside the campus, which is now getting a regular feature. We appeal all the students to restrict the invasion of vested interest politicians and their followers. On the evening of 15th of August 2008 when the nation celebrating Independence Day, Youth For Equality joined the country with a perfect celebration. The Youth For Equality, JNU organized a cultural evening at the School of Social Sciences Auditorium. It was another priced occasion; the Youth For Equality may cherish and harbor the happy memory for the time to come. The evening was full of Youthful events. The cultural evening was started with Extramural lecture by invited guests (Chief Guest Dr. Binod Khaitan, President, Faculty Association, AIIMS; Chief Speaker Shri Satya Prakash Aseem, Editor, Aaj; Guest of Honor Dr. Shiv Choudhary, AIIMS and Chairperson of the occasion Prof. Rakesh Bhatnagar, JNU). All the speakers touched upon subjects very close to the heart of every YFEians – how to grow and achieve the objective of making India a developed nation free from hunger, poverty, illiteracy and discrimination. Anchor Sonam Grover and Vikram Singh threw the programme to the packed audience with a testament: Kuch baat hai humme; ki mit-ti nahin hai hasty; Sadiyon raha hai dusman; daure jahan hamara; Sare jahan se achha; Hindustan hamara. The evening started with patriotic songs performed by JNU students. It was followed by a series of Odissi dance, both solo and group, performed by acclaimed Odissi dancer Kalyani Behera. As the evening proceeded, one after another song and calibrated dance performance presented to the audience. The cultural evening in JNU during the occasion of National Days is now becoming popular. The participation is not confined to the boundary of JNU only as students from other educational institutions – Maulana Azad Medical College, University College of Medical Sciences, All India Institute of Medical Sciences, Delhi University and Indraprasth University are also present on this occasion. To give the cultural evening an international character, the organizers arranged a fusion music programme comprising of performers from India and Iran. It was an instrumental musical fusion of various instruments. The jugalbandi, the solo performance and the clapping from the present audience made this cultural evening a grand success. Gradually this event is getting more and more attention in the student community. It is an effort by Youth For Equality to engage youthful mind in the precious task of nation building and also to keep the students aware about the rich culture of India. Certificate of excellence and participation was given to those who performed at the stage and to those who have worked for Youth For Equality. The programme ended with a promise to make it more inclusive and better next time. 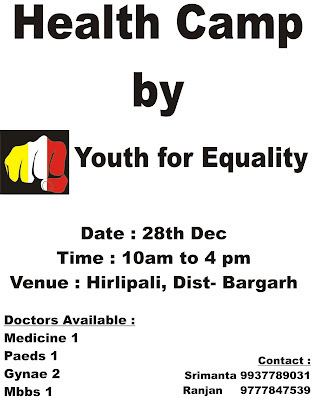 As a part of its awareness campaign, Youth For Equality, DU is going to lanch Satyagrah. The main emphasis of this campaign is to make students aware of the falacies of the present caste based quota system and at the same time propogate the 'Deprivation Points' model suggested by Youth For Equality. We need part time voluntary/paid workers for research and maintaining other YFE activities. Good working knowledge of English, typing, MS Word, and Internet. Time Requirement: 2 to 4 hours a day. The voluntary workers can work from their own work place. We also require voluntary workers for upcoming "Youth For Equality Times" for content development , both in English and Hindi. You are aware of the consistent efforts of Youth For Equality to Oppose divisive reservation policy. As a part of our opinion building exercise and to gather support from Youth masses, Delhi University unit of YFE has decided to contest Delhi University Students Union (DUSU) election this year. DUSU plays vital role in national politics and by wining DUSU we can ensure that, the discriminated meritorious youth's interests are taken into account. This will be an apt reply to the divisive and discriminatory policies. 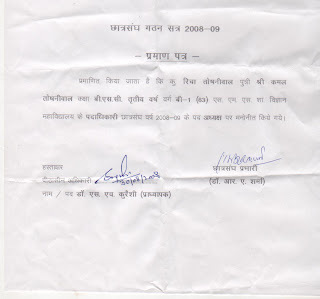 All political parties in India which are favoring this reservation policy will start counting us as a force of change. Your active participation can ensure YFE's progress in defeating the divisive political forces. Election Date: First Week of September (Friday) 2008. Please convey the message to all YFE supporters and specially those who are studying in Delhi University Colleges to turn up on polling day and Vote for YFE. New Delhi. Renowned author and business consultant Shri Shiv Khera launched the Bhartiya Rashtravadi Samanata Party (BRSP) on July 14th with a promise to work for the upliftment of weaker sections of society based on the economic criterion. The party declared to take a public stand against all caste and religion-based reservations and the policies of the appeasement. In fact, Mr Khera has been a consistent and one of the most vociferous supporter of Youth For Equality in its fight against caste based reservations.